Suzi Kondi dress, far right, goes iconic in a New York magazine street fashion history slideshow. Media-magnet, designer Suzie Kondi is having another it-girl moment with her featured item in a New York magazine 40-year history of street fashion. Get this: the history begins in 1968 with a really, really mini dress and ends 40 years and much fashion meandering later with Suzie’s really, really mini dress. So she’s not just another page in fashion history—she’s the last page. See the fashion slideshow here. P.S. Check out Suzie’s adorably, effortlessly hip line here. I am constantly changing my hair. I view hair as a sort of accessory, a great way to accent a new look. So it’s often that people don’t recognize me from one time to the next—I’m a chameleon that way. 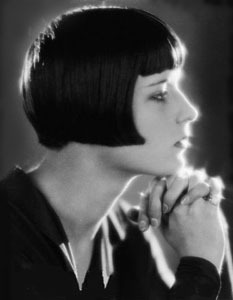 Recently, I wrote about entering a new hair dimension by finding a fabulous set of sister salons: Public and Woodley & Bunny. Well, my mother flew in to see me and get a second haircut with me for my birthday. It just tickles me pink that my 60-something mom loves this hipster salon (the stylists all remind her of her ’70s heyday). My mother has her hair cut by Ginger, and I had finally secured an appointment with the artistic Andy. When I sat down in the chair, he asked what I wanted. I said that I was up for anything. And he suggested bangs. Bangs!!! I have not had bangs since I was sixteen and wearing braces on my teeth and back. I have this picture that is so completely ridiculous from my high school album. I am wearing a really cute cadet-blue, plaid, bow-tie dress that I wish I still had, and my face is half-braces and half-bangs. Then before that I was five and slightly cuter, but still, I was five. Now I’m in my forties. I winced at the memories. “Bangs,” I said weakly. “I don’t look so good in bangs. They are just so … irrevocable.” It was hard to turn down an artist’s inspiration, but I just couldn’t see it. Well, that was a different story, but …. no. He shrugged and set to patiently cutting my hair just as it has been for the past year. Well, really long hair was definitely out of the question. But here was a man who created the looks for Fashion Week. Couldn’t I just be a little flexible? I pondered this as he trimmed away. Soon, he would be finished, and my chance for change would be gone. I always say no to change at first, but I always reconsider. But the best comment was from a work friend: “Lulu,” he beamed, upon first seeing me. “That is the best look on women over 40. Women in their 20s just don’t look that good in bangs.” Now that definitely put a spring in my step. And if I put on dark eyeliner and tilt my head just so, to my left profile, and squint, I really do look like Lulu. I was out in Sag Harbor, L.I., today and while it’s very charming in a seafaring sort of way, it isn’t exactly a fashion mecca. But then I stumbled onto the Lisa Perry store, a mod, mod flower blooming in a style desert. The impeccably-made, ’60s-inspired, knit wool shifts with graphic inserts are some of the freshest dresses I’ve seen around, so I wasn’t at all surprised to find out they also have a store in NYC’s SoHo. At $1000 per, they are a pretty penny indeed, but are they ever pretty. See more dresses here. Tags: affordable, anna sui, boho, boots, budget style, Designer, embroidery, ethnic prints, Fall '08, luxury bohemian trend, paisley prints, recycled, Recycled and Retro, recycled clothes, sienna miller, smock tops, Vintage, what would marilyn wear? itself in various trends that can be seen right there on the catwalks of London, Paris and Milan and followed vigorously by the fast-fashion boom on our high-streets. This autumn/winter sees a continuation of the Boho look that’s been prevalent for quite a few years now, and made famous by the likes of Sienna Miller and various other celebrities. The “Luxury Bohemian Trend” is a take on this look but with a more ethnic/folksy feel. Fabrics are luxurious and rich and the colours tend to have a dark base with highlights in red, purple, yellow and pink. Patterns can be found in the shape of hearts, paisley prints, flowers and teardrop shapes. Floaty tunics with bracelet sleeves are teamed with large, statement necklaces, patterned tights, boots and Mary-Jane style shoes which together, makes this a very feminine and easy-to-wear look for all shapes and sizes. 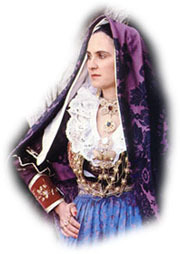 Here I’ve shown an example of a folk costume from Sardinia just so you can see how the influence has effected this current trend. There are of course, hundreds and thousands of ethnic costumes to choose from. Two fashion giants that I think have shown the Luxury Bohemian Trend particularly well are Gucci and Anna Sui. Their runways shows were full of lush fabrics, dropped waists, patterned tights, faux fur gillets and ethnic prints. Of course, not everyone can afford their designer prices so there’s plenty to choose from on the high street – that’s if you don’t mind wearing clothes that you’ll see on every other girl or women in the land! One of my missions in life (if you didn’t know already!) is to encourage people to look at what’s available in the wonderful world of vintage. Yes of course you can go to any vintage boutique in New York, London or Paris and pay a small fortune for a labelled vintage garment. However, if you’ve got an idea of what you’re looking for, I can think of no better way (well almost none!) of spending your evening or Saturday afternoon, searching for that special item that looks as if it’s been taken straight off the latest runway – and that’s the exciting thing about vintage clothing. You just never know what you’re going to find! A great place to start is Etsy because all your sellers are under one roof, so to speak. The sellers there can only list “genuine” vintage clothing, that being a garment or accessory that’s at least twenty years old. It has been known that some would consider vintage as a garment that’s been worn from just the previous season. However, to anyone connected with Etsy, this is not the case and never will be. True vintage fashion has a history; an essence within it that makes it special – it’s unique and beautiful and you’ll be hard-pushed to find another garment anywhere that’s exactly the same. The only thing I recommend you have on hand whilst shopping for your vintage clothing are your measurements. So, invest in a tape measure and get your vital statistics written down. Make sure you measure yourself regularly as we can all loose or gain a few pounds without even noticing. Shopping for vintage on-line is one of the easiest and best ways to get hold of your vintage. There’s tons of inspiration to be found on Etsy and I’d like to say a big ‘thank you’ to each seller who has kindly agreed to me using their photographs for this piece. Every item shown here is currently available for sale at the time of writing. You can find the names of each Etsy store or website under pictures and at the bottom of this blog. Now this is just a small example of what’s available in “vintage land”. I think you’ll agree that these pieces really do well in showing how a new look can be achieved quite easily using vintage clothing. After all, it’s not really “new” at all—it’s just fashion that’s gone full circle and reinvented itself with a modern twist. Anything with a folksy/ethnic feel such as: tassels, fringes, feathers, dropped waists, patterned tights, boots, Mary-Jane’s, large statement necklaces, faux fur gillets, Boho coats with embroidery detail, floaty smock tops; luxurious fabrics: velvet, satin, silk; printed fabrics: paisley, tear drop, hearts, flowers, embroidery, braid, embellished belts. Here’s some more vintage goodies which fit in perfectly with the luxury Bohemian trend. WARNING: Drooling could occur! Read more by Louise Sleigh, owner of a vintage clothing site at her blog: Catwalk Creative Weblog . 60s Tan Embroidered Coat from What Would Marilyn Wear? Credits: Decades Vintage, Lionheart Vintage, Some Like it Vintage, The Spectrum Vintage, Planet Claire Vintage, What Would Marilyn Wear? La Dolce Vita Clothing, Kirtsch-y-Cool Vintage (eBay). Folk costume photograph from www.costumepage.org. My singlemost favorite magazine feature is the stylish-gal-on-the-street pictorial, whether it’s in Glamour or the New York Times. But Katya at styleddefined.blogspot.com has outdone them all by creating a blog that is exclusively devoted to stalking stylish creatures where they live: art openings, the Lower East Side, and swag-laden parties. Don’t know what to wear today? Get the chic street scoop here. If you crave a website that offers everything from fall’s essentials to how to choose and care for men’s jeans, plus the scoop on beauty and fashion must-reads, Haute Mimi is for you. Self-described as “an online publication for the international habitue and fashion devotee,” Haute Mimi will keep you totally in the fashionista loop. Plus, editor-in-chief Millissa Mathai (a.k.a. Mimi) is not only haute, she’s friendly—just the sort of cool pal you’d want helping you sort through your closet. Visit Haute Mimi here. Who can argue with the spectacular value of H&M? We all head there to get trendy runway knockoffs and wardrobe filler pieces for a fraction of the designer pricetags. In the past, everyone from Karl Lagerfeld to Madonna has designed for H&M, but now we’re takin’ it to a whole new level, when in November, Rei Kawakubo of Commes Des Garcons brings Japanese cult fashion to this pocketbook-friendly store. Read more here.